My elementary science series is finished, and I am currently working on a junior-high course that carries on with the theme of teaching science through history. My elementary science series has been complete for a while now, and I am thrilled to see it becoming popular in the homeschooling community. The series teaches students science in roughly chronological order. It begins with the days of creation (Science in the Beginning). It then moves on to the ancient Greeks (Science in the Ancient World), teaching science in the order it was learned. It continues through roughly the end of the 1800s (Science in the Industrial Age). If a student completes all five books in the series, he or she will be very well prepared to start learning science in a detailed way in junior high school. 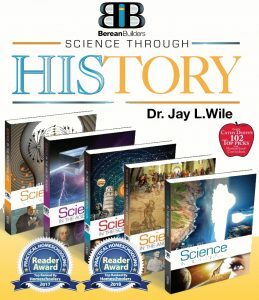 For quite some time, I have been hearing from homeschooling parents who would like me to continue the theme of teaching science through history into the junior high school years. With the encouragement of my publisher, I have decided to give it a try. I am currently working on Science in the Atomic Age. It will be a junior-high-school level course that covers many of the scientific discoveries made in the 20th and early 21st centuries. I plan to discuss the modern view of the atom, how atoms join together to make molecules, what the molecule known as DNA does, the cell as the basic building block of life, several of the advances that have been made in medicine, the structure and characteristics of the universe as a whole, radioactivity, and nuclear reactions. While it carries the theme of teaching science through history, there will be at least four important differences between this course and my elementary courses. First, in the elementary course, I teach all of science on a timeline. As a result, the books change science topics constantly. In the first 15 lessons of Science in the Ancient World, for example, students start by learning the importance of math in science, then learn about the science of music, then learn about atoms, and then learn about medicine. It’s difficult to cover scientific advancements made in the 20th and 21st centuries that way, because the issues become more complex, and it is important to see the development of one particular topic over the years. So while I will still discuss science in the context of history, it will be by topic. In other words, when I write about our modern understanding of the atom, I summarize what was known towards the end of the 1800s. I then step students through the history of atomic science, eventually ending with our current understanding of the atom. As a result, students see how the entire field of atomic science developed through the course of the 20th and 21st centuries. I then move on to molecules, but once again, I step back to the end of the 1800s and discuss the history of how our understanding of molecules developed. When I get to DNA, I “reset the clock” once again, starting with what was known at the end of the 1800s and working forward to the present day. Now, of course, the focus is on the science, not the history. The students aren’t learning what happened in the world during the 20th and 21st centuries, unless those events affected scientific progress (like the World Wars). Instead, they learn the history of how scientists were led to our modern views. Because of this approach, students not only learn the science of what is being discussed, but they also learn the scientific reasoning used to reach our current understanding of scientific issues. The second major difference between Science in the Atomic Age and the other books in my series is that it will be much longer. More science has to be covered in junior high school, so unlike my elementary books, this book is designed to be used every day. The third major difference is the frequency of experiments. In my elementary series, each time the student does science, he or she has a hands-on activity, usually an experiment. While there are still experiments and hands-on activities in this book, there aren’t as many. In a two-week period, students will do three or four experiments or activities. That means the student will be expected to do more reading in this course. The final major difference is that the book switches from a notebooking approach when it comes to reviewing the material to a question/answer approach. There are “comprehension check” questions the student needs to answer while he or she is reading. Then, at the end of each chapter, there is a chapter review to help the student remember everything that was learned. Finally, there is a test for every chapter. In order to prepare the student for high school and beyond, it is important that the student answers all of those questions and takes the test. I have only just begun writing this course, so it won’t be available for this academic year. However, I hope to be able to choose a group of students to “field-test” the book for the 2019-2020 academic year. However, that will depend on my progress. Assuming that I can start the “field-testing” on time, the book should be ready for general use in the 2020-2021 academic year. Of course, the Lord might have quite different plans, so stay tuned to find out what happens! Would a student use this instead of General Science in grade 7? Yes. General Science would be more appropriate for students who have not taken my elementary courses. Science in the Atomic Age is more appropriate for those who have taken my elementary courses. Keep writing, Dr. Jay! Your work is a ministry and your books are a blessing! So excited to hear this! I appreciate your work! I have a general question about the entire series–hope it’s okay to ask here. I am a strong Christian and I do not believe in evolution (although I believe the earth and universe are both old), but I have been put off by many Christian science texts that make out evolutionists to be idiots or in on some kind of conspiracy. I would like the evidence for purposeful design in creation to be taught in a way that is respectful of other viewpoints, as an example of the winsome way we as Christians can approach our non-Christian friends about these issues. What type of coverage do you give to evolution in your Industrial Age text? Thank you if you can take a minute to answer this question (if not, I completely understand!) God bless! It’s fine to ask such questions here. I agree with you that it is very off-putting for Christian sources to make evolutionists look like idiots or part of a vast conspiracy. I actually start discussing evolution in Science in the Age of Reason, where I talk about the most accomplished of the Darwins (Erasmus Darwin) and his views of evolution. I also discuss the emergence of old-earth ideas at that time. In all cases, I indicate where I think the thinking is wrong, but I present their views honestly and with respect. When it comes to the Industrial Age, I discuss Lamarck’s idea of evolution as well as Darwin’s. As is the case with my high-school biology course, I give Darwin strong credit for destroying the idea of species fixity and for correctly describing natural selection. The publisher has samples of my books on its website, and the Darwin lessons were put in the sample. That way, people know how I address evolution. Thank you for your answer! I read through the samples, and I am impressed with your respectful and thoughtful presentation on these ideas. So good; this will be such a useful resource in training our children (and ourselves) to engage our friends, for God’s glory! Again, thank you! This Could Be One of the Most Important Scientific Papers of the Decade No, We Won’t Have Dinosaurs in Two Years!